or 6 interest free payments from $13.16 with LAYBUY - Whats this? SKU: 6704. 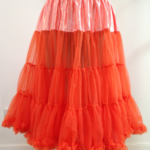 Category: Women's Petticoats. 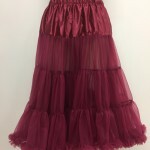 This petticoat sits on the waist, with an elasticated waistband. There are two layers of tiered, volume-boosting fabric and a short inner lining, which surrounds the legs. 1. They’re so soft and fluffy, due to the nylon mesh. 2. The 3 panel mesh gives more structure, volume and better form. 3. 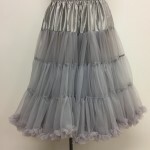 The 5cm elastic waistband keeps the petticoat in place and does not slip! 4. There are also two buttons on each side of the waistband, to adjust the fit. 5. 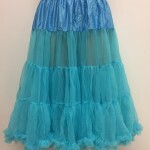 The petticoat is easy to shorten in seconds, by just folding the waistband over! 6. The inner lining is soft on the skin, to avoid any irritation. 8. Three sizes available; UK 6 to 12 ( S ) , UK 14 to 18 ( M ) and UK 20 to 26 ( L ). Washing instructions: Wash at 30 degrees, recommended in a washing bag. Do not tumble dry.